5. Prospecting - We call every day looking for buyers for your home. Where most agents place a sign in the front yard and pray that the home sells we take a proactive approach to actively search out buyers for your home. If you are wondering what your home is worth in todays market and you would like a FREE "NO OBLIGATION" home valuation. Call us right now at (503) 877-3637 and we promise to provide you with a prompt response. What have you got to loose? Do you want to sell your home and you think that you are upside down on your mortgage? We can help! Please take a moment out of your day to try out the Short or Stay Calculator. Being able to see the current market value of your home and projecting when your investment will break-even and become an asset again is invaluable to your decision making process. 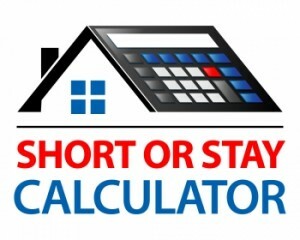 With the Short or Stay Calculator you’ll be able to do so in a matter of minutes. Take a moment to find out if a Portland OR short sale may be the best option. Sometimes you just have to sell and a short sale is the only option. Do you have a Bank of America Short Sale? - WE CAN HELP! Do you have a Wells Fargo Short Sale? - WE CAN HELP! Do you have a Chase Short Sale? - WE CAN HELP! Call the Portland short sale specialst to help you determine if a short sale is the right move for you.